A group that identified themselves as Ohanaeze Youth Council have called the Federal Government of Nigeria to declare the Fulani Herdsmen terrorists and consequently, ordered the herdsmen to move completely out of Biafra land. The Ohanaeze Youth Council, OYC, Wednesday ordered Fulani herdsmen to vacate the zone forthwith. The warning is contained in a statement issued after the OYC’s emergency meeting in Umuahia. 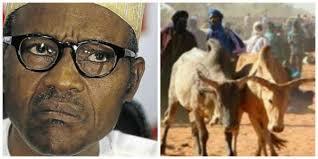 “We condemned vehemently the terrorist attack of the Fulani herdsmen and call for self defence as a measure to halt it. “OhanaezeNdigbo Youth Council worldwide has banned and proscribed the outlawed Fulani herdsmen in Igboland especially in the 95 LGs of South East and call on the Youths not to take laws into their hands but want the federal government to declare them a terrorist group.